For those readers who have been around as long as I have, your first vision at the mention of Morgan 38 is likely the classically styled, late ’60s, Charley Morgan-designed sloops and yawls that were Morgan’s follow-up the successful Morgan 34. 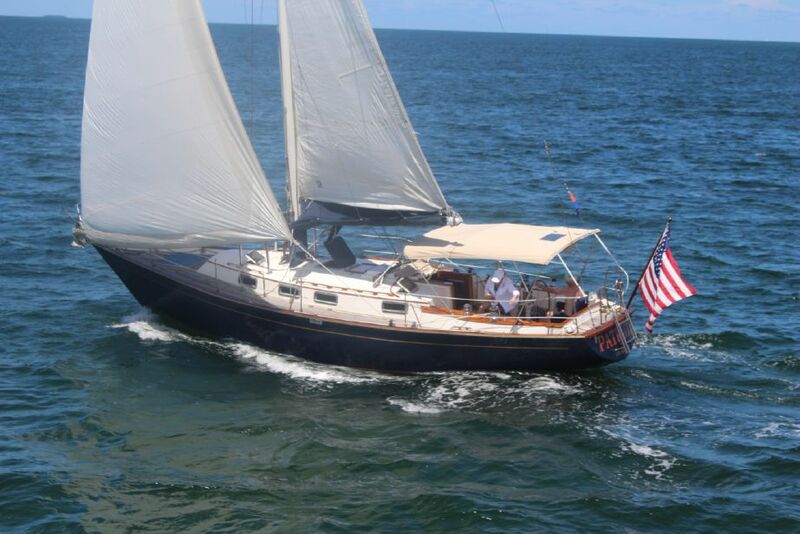 For more recent devotees, Morgan 38 brings to mind a more contemporary series of 38 footers introduced by Morgan Yachts in 1977. In 1993 still another Morgan 38 was introduced. All models are commonly referred to as Morgan 38s but that’s where the commonalty ends. Only about 80 of the early Morgan-designed 38s were built, while nearly 500 of the 1977 Ted Brewer-designed series were built. The 93 model was a rather bulbous center cockpit model that has nothing in common with other models except its name. Space is limited and there are generally many more of the Brewer-designed models on the market, so I am going to concentrate my look this month on this series. Very few models of boats have been built for protracted periods without some changes to their form or layout and the Morgan 38 is no exception. Introduced in 1977 as the Morgan 382, minor rig changes resulted in a model name change to Morgan 383 in 1980. In 1983 there were several more changes and again the model name changed to the Morgan 384. Although Morgan Yacht was purchased by Catalina in 1985, the Morgan 384 continued in production until 1986. In all its incarnations nearly 500 boats were built in this series. Though model numbers changed the principal dimensions; LOA 38’-4", Beam 12’ and Draft 5’ were not changed. Some deep keel versions were offered drawing 6’ rather than the standard 5’ draft. When the 383 model was introduced, the only change, to the best of my knowledge, was a slightly taller rig. This change resulted in a higher aspect mainsail and an increase in sail area of about 12 square feet. When the 384 model was introduced, there were several subtle changes. The rudder was slightly enlarged, there were slight modifications to the interior, mid-boom sheeting was introduced, and the traveler was moved out of the cockpit to the cabin top and ventilation was improved with the addition of four Dorades with cowl vents. The sail area increases on the 383 series resulted in the 383 and 384 models rating, on average, three seconds per mile faster than the 382 under the PHRF rule. Construction of this series is generally sound with one known exception affecting some early 382 models. The bulkhead between the head and the main cabin was not tabbed securely to the hull. This resulted in mast loads causing hull distortions. The problem resulted in a manufacturers recall when it was discovered. I’d be surprised to find boats that have not been repaired by this late date. Reportedly, some 382 model boats were constructed of solid fiberglass and resin laminates. However, most boat were built with a sandwich method of construction using fiberglass and resin laminates over a core material. A variety of core materials was experimented with over the years. Airex foam was most often used, although it is difficult, if not impossible, to determine, with certainty, the core material used without destructive testing. Some 382 and 383 models were reported to have been built using the same fire-retardent resins blamed for causing much of the osmotic blistering problems that plagued Valiant 40s and Uniflite power boats. Few 15-to 20-year-old fiberglass boats are seen without some osmotic blisters unless there have been extensive and expensive repairs. It is not uncommon to find some degree of blistering on Morgan 38s, but I have not seen nor heard of a problem as extensive as the reports of the Valiant and Uniflite. The performance of this Morgan 38 is typical of her class with generally good speed and pointing characteristics, and good maneuverability. The Morgan 38 does not balance easily or track particularly well when sailing off the wind. These deficiencies were somewhat improved on the 384 model with the increase in rudder size. For auxiliary power most of the 38s were equipped with the 50 hp Perkins 4-108 diesel which provides plenty of power and smooth dependable operation when properly maintained. Some of the first-generation 382 models were powered by the Yanmar 3QM30 engines. This engine provides adequate power but is very noisy and vibrates considerably compared to the Perkins power. All Morgan 38s in this series are handsome, contemporary styled, comfortable yachts built sufficiently strong for most uses. Boats that are well maintained and cared for hold their value as well as or better than most boats of this class.